Are you ready for some seasonal magic? 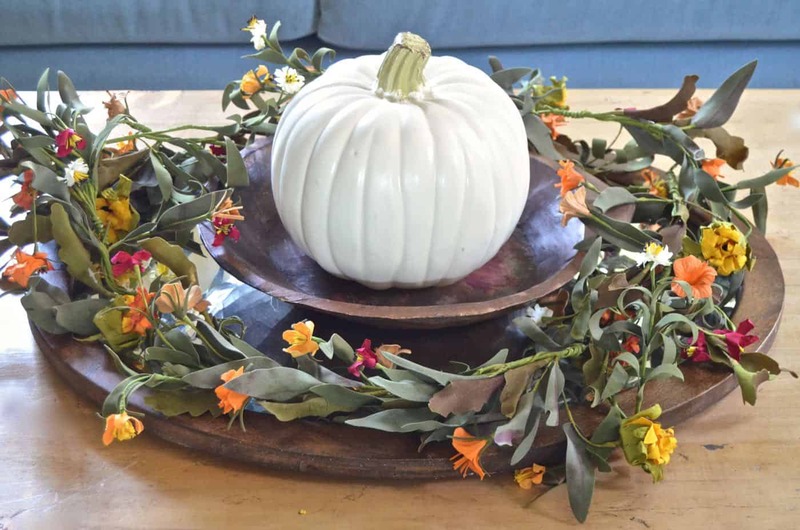 Mantels overflowing with autumnal abundance? 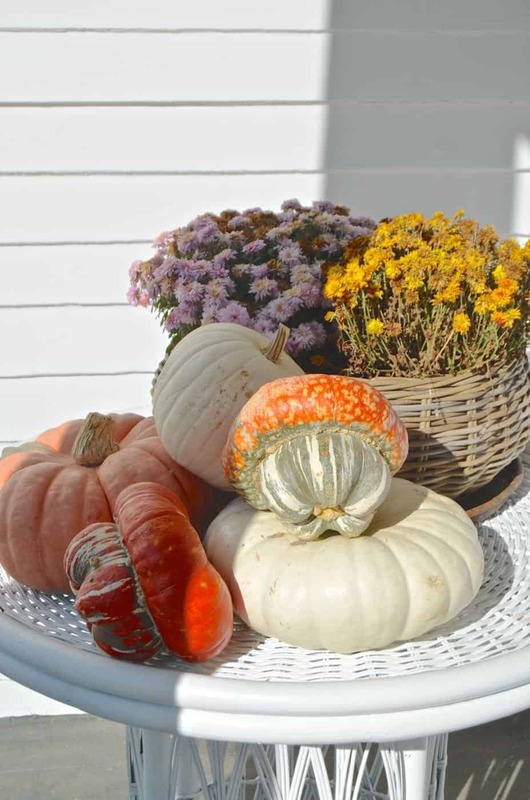 Pumpkins and gourds and mums galore? Acorns scattered ever so delicately across a harvest table runner with bundles of silk wrapped wheat place cards? Well… head on over to google for that. I’m well aware of the date, folks. 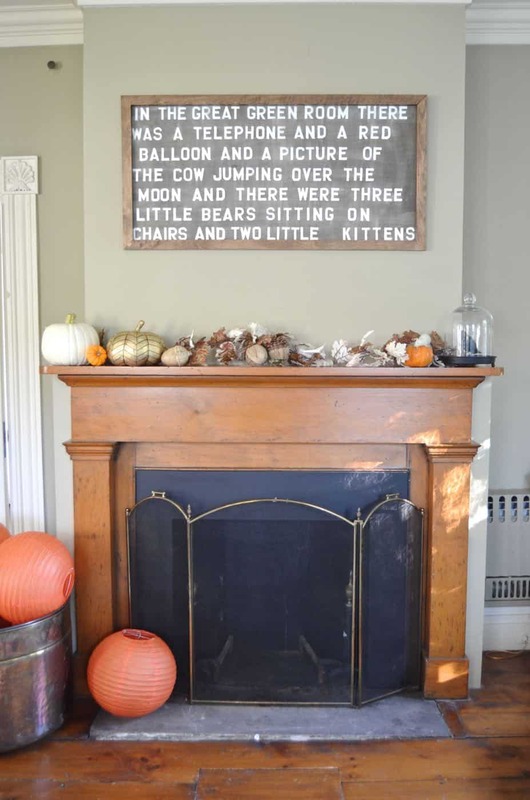 And yes… a group of us are proudly posting our Fall Home Tour with a week or two left of “fall.” As bloggers, we’re accustomed to the full blown holiday fervor that can take over our homes this time of year. But… we’re the first to admit that we can sometimes use a break. 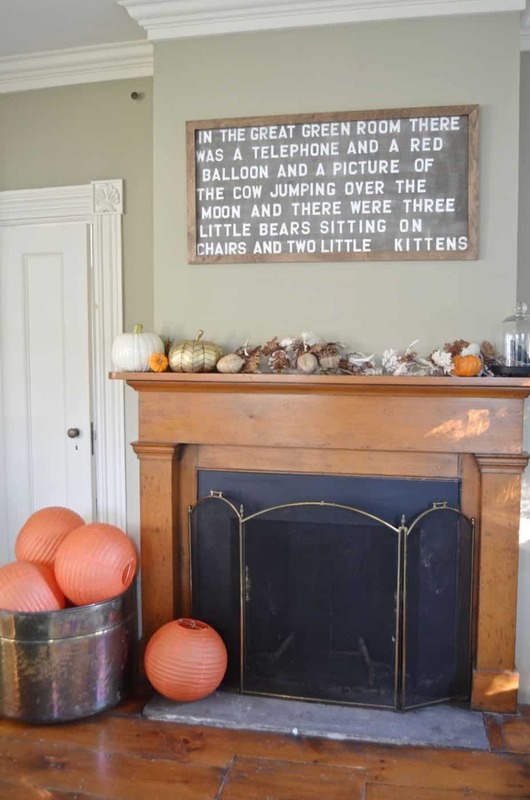 It’s not that we don’t love the seasonal decor, but we can’t always get it together to redecorate our refrigerator magnets or organize our bookshelves into shades of orange, red and yellow each autumn. 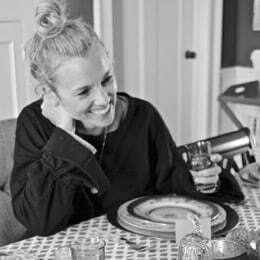 Today we’re sharing a candid peek behind the scenes of our simple- somewhat totally lazy- Fall home Tours. I’m going to jump right in with the front porch. What you’re looking at here is a pile of pumpkins and some 90% dead mums in the planter behind them. I could tell you they peaked a week ago, but it’s more likely that I forgot to water them. And there they sit. This go-to move might intimidate you, but email me if you have any questions. I’ve placed a few mini-pumpkins into this industrial tray. On a bench. 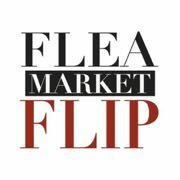 After three years blogging, you learn a few tricks. Give it some time and you too can reach this level of design brilliance. I found at Goodwill, a frame and an apple dish/ bowl/ container. I was *going* to plant something pretty in that apple dish. But I didn’t get around to it, so I placed a glittery scull in there. 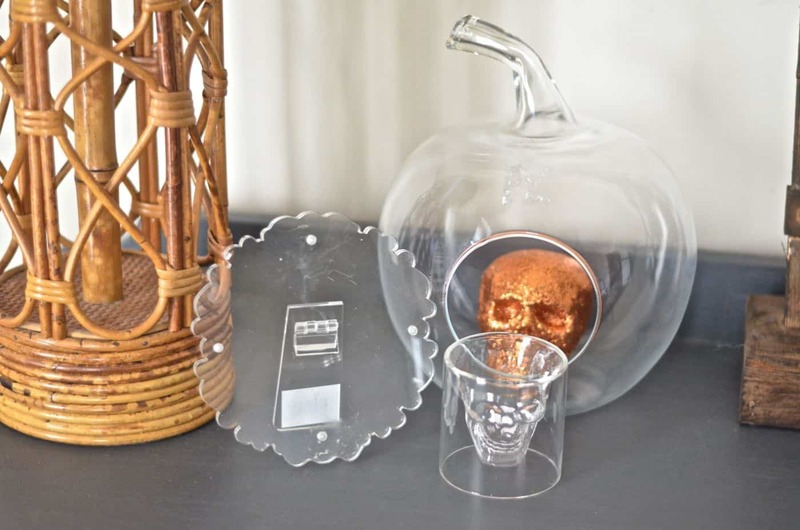 To go with the random scull shotglass. Coordination at its best. That vintage calendar was in a box I hadn’t unpacked since our move. In April. I figured if I selected a fall date, it could count as fall decor. And that’s a black candle. Spooky. 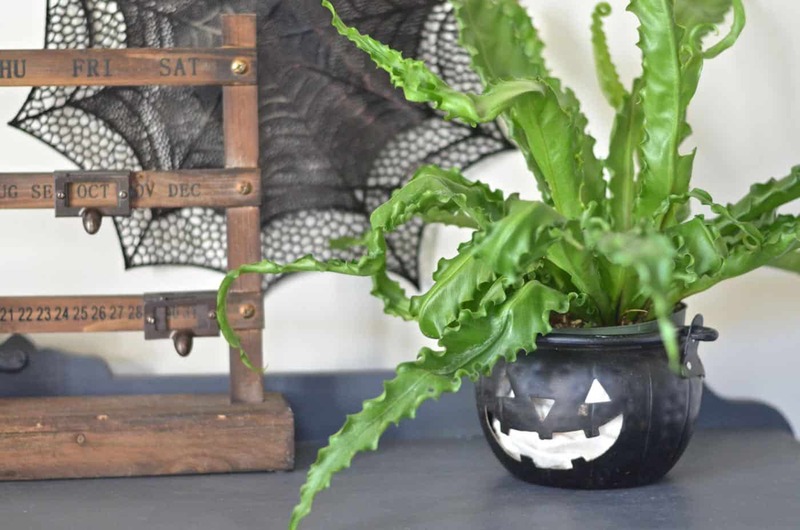 That’s a fern in a jack-o-lantern. The spider web is a placemat, but I was too cheap to buy more than 2 of them. 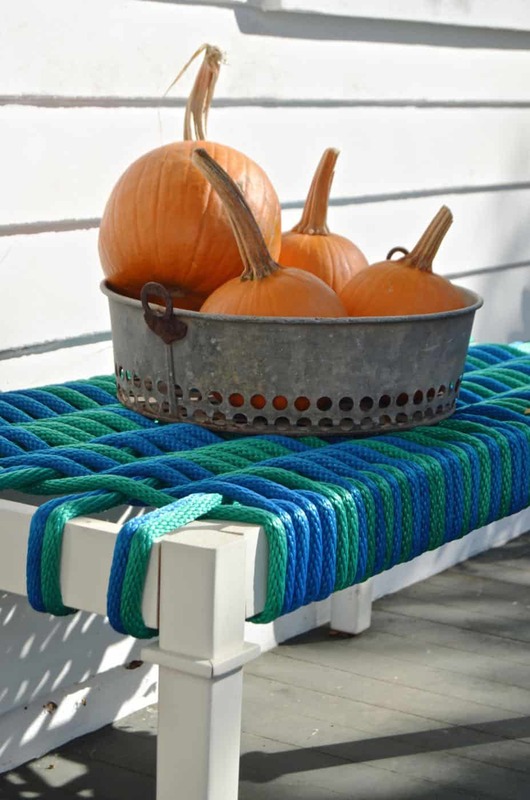 And 2 placemat spiderwebs only look good when they’re cropped just right in the photo. In real life, they’re two tiny placemats on a big empty wall. 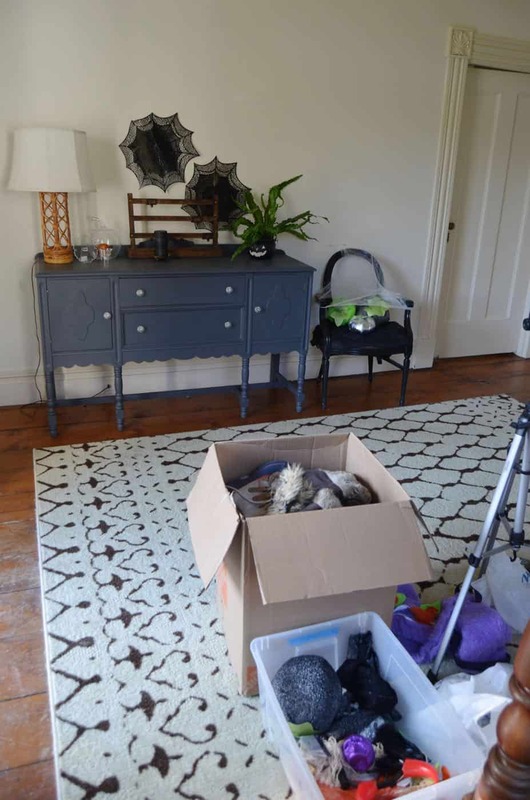 The wall is empty because the 12 thousand pound mirror we want to hang there is still leaning behind the dining room door because I can’t handle the pressure of hanging a 12 thousand pound mirror into 100 year-old plaster and lath walls. I like to call this my version of the ghost chair. Which makes me chuckle because a ghost chair is the epitome of sleek and modern cool and this… is not. It’s actually one of my red chevron chairs that I’ve been in the middle of reupholstering for about 3 months. I spread a black piece of fabric over the foam and used a $1 bag of spider web I found in our Halloween storage box. Those are pumpkins I sewed a couple of years ago. If you happen to be lucky enough to step back 8 feet, you’ll be able to peek inside this box of hats and gloves that was pulled out last week when we woke up unexpectedly to frost. That bad boy will probably spend the next month in our foyer. Decorating’s fun, y’all. From another angle. Because it might look fancier in one shot than in another. Just so you have a wide shot, be impressed by the Christmas project that’s tucked in the corner and the red table that *still* doesn’t have a home since we moved in 6 months ago. 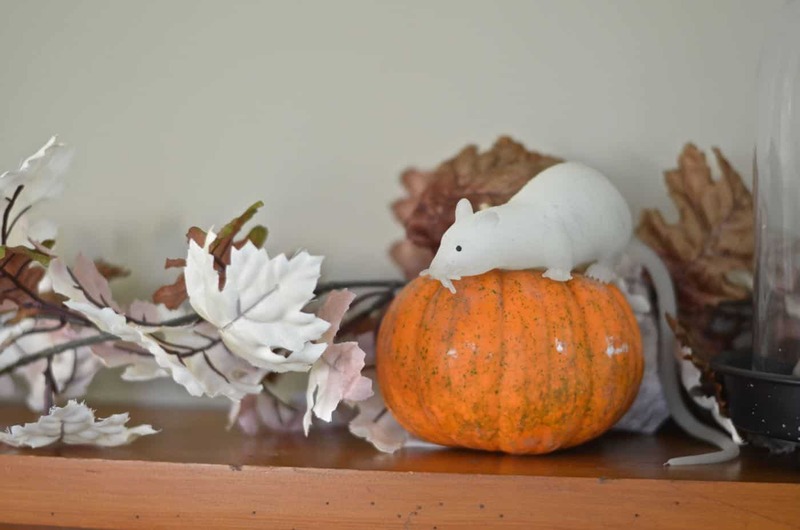 Moving over, here’s a rubber rat perched on a pumpkin. Again… don’t feel inferior. It takes practice.
) around a fake pumpkin on the coffee table. Pretty sure that counts as the rule of thirds since there are three things. 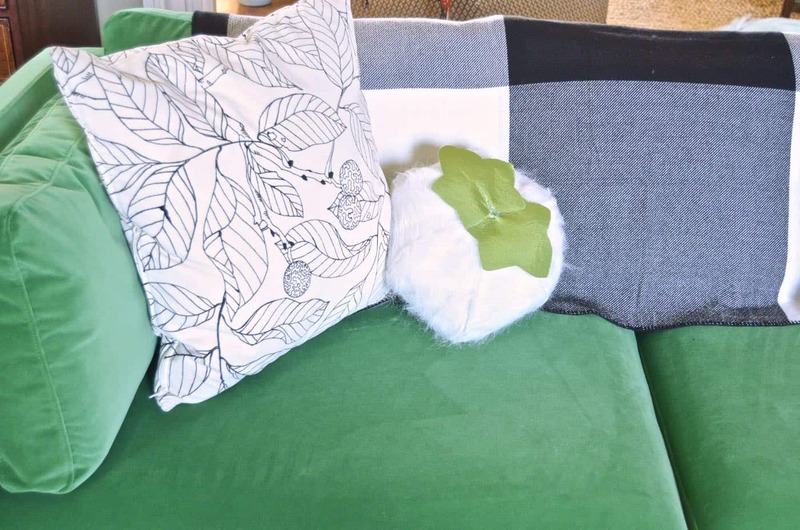 Here’s an easy trick for declaring your home ‘seasonal’… plop a throw blanket and a fun pillow onto the sofa. This blanket is a fave from the newest Adam Lippes plaid line at Target. 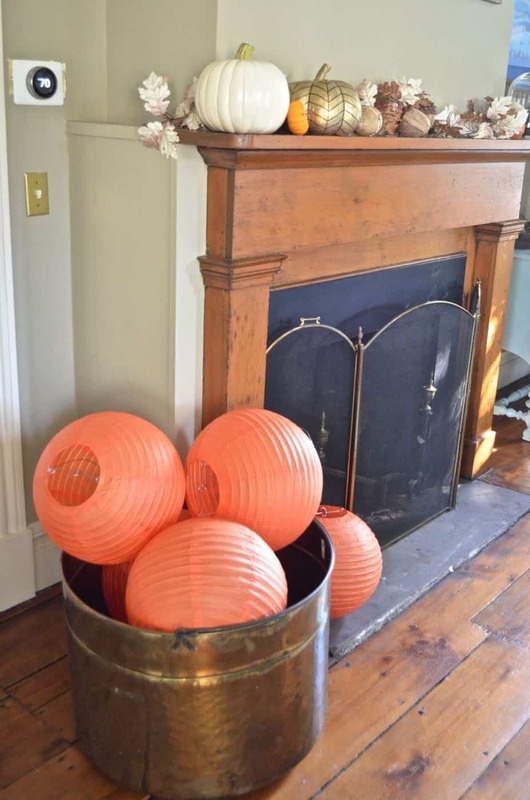 Last but not least, what’s a girl to do when she finds a bunch of orange paper lanterns that she’d been planning to add jack-o-lantern faces to but didn’t get around to it? Just pile ’em up in a big brass cauldron. Halloween in the house. 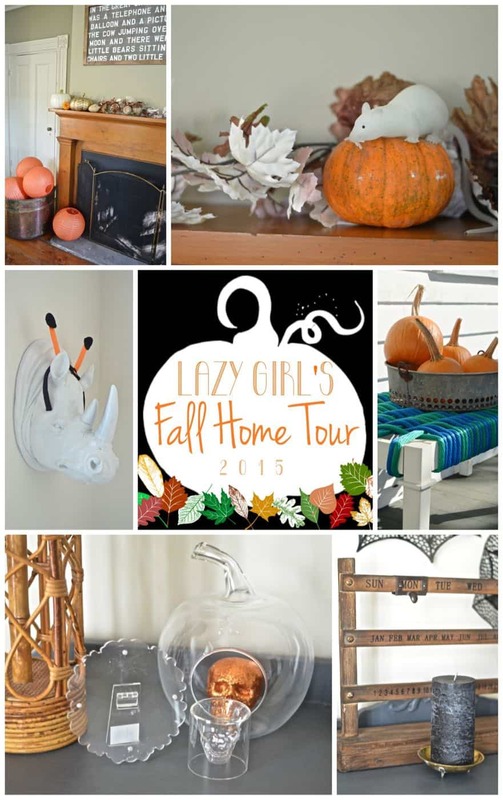 While you’re waiting to pull your jaw up off the floor, head on over to visit the other Lazy Girl Fall Home Tours that are up today. 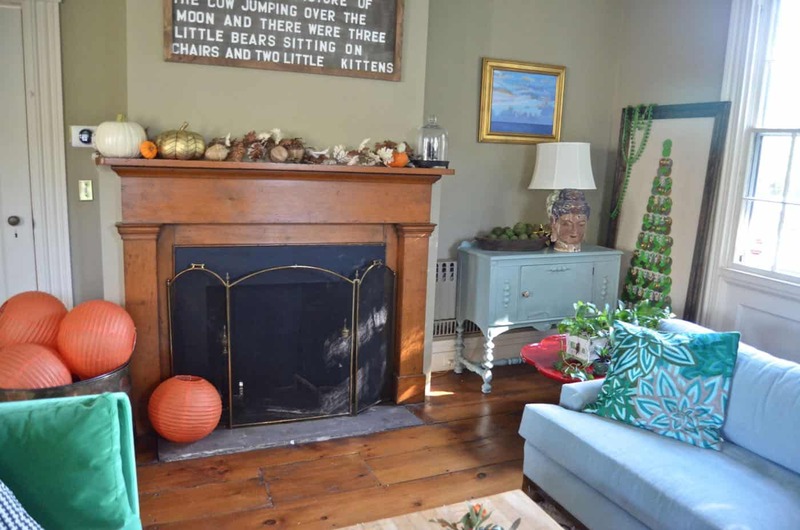 I’m sure you’ll be just as inspired by their decorating mastery as you undoubtedly are after seeing my laborious fall tour. 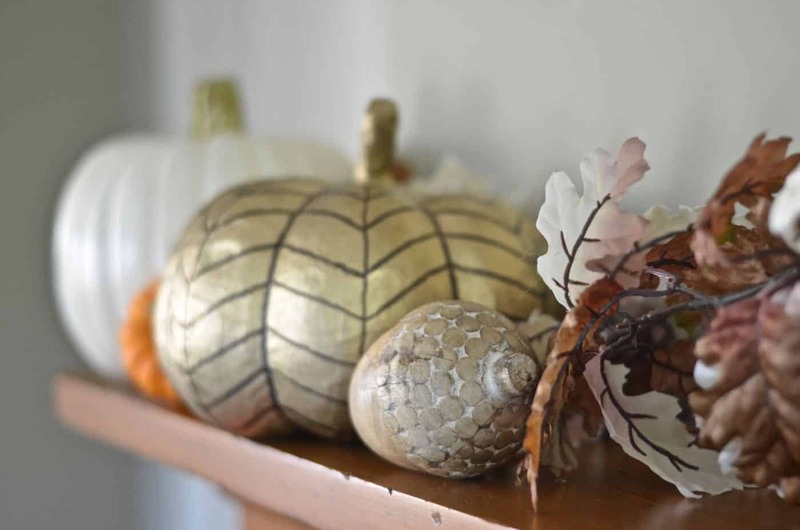 Perfection….. fall decor at its finest. I absolutely love it! Nowhere to go but down from here, right?! 😉 Glad you were able to join the #lazy fun! OMG I’m dying you are so flippin’ funny! I think a taste of reality is so refreshing. And by the way dead mums are totally in this season. Totally in. Cutting edge decor over here! 🙂 I can’t wait to go through and read everyone’s… I’ve been running around all morning! I love it Charlotte! The Christmas projects in the background, the dead mums, I don’t get it 🙂 LOL. So much fun joining you with this tour! 🙂 It’s a bar that few can achieve, I know… I’m thinking #lazygirls might the new theme of my blog!! I’ve found my tribe! Absolutely hilarious! I like to think I have to wait for each season…fall first, then Halloween, then Thanksgiving…but you’ve helped me admit…Just Lazy! Thanks for keeping it real! I’m now inspired to go the attic to find my Halloween decorations. I think I love you! That was awesome! I love every bit of this! 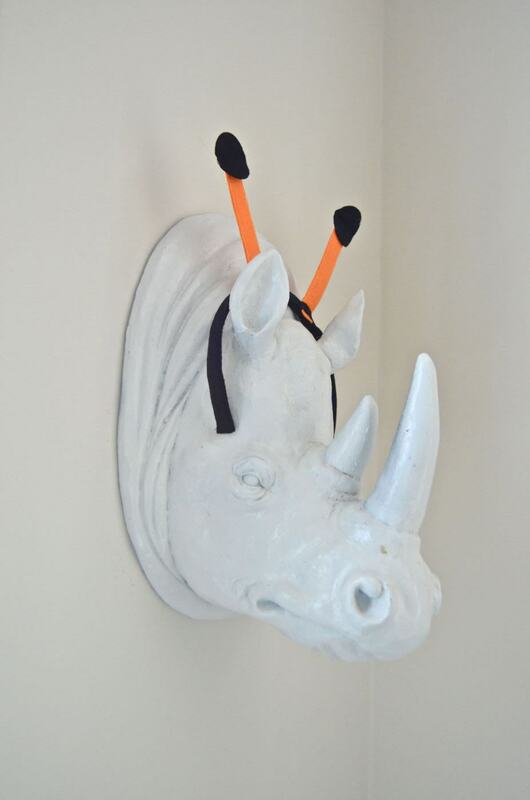 That rhino is everything. 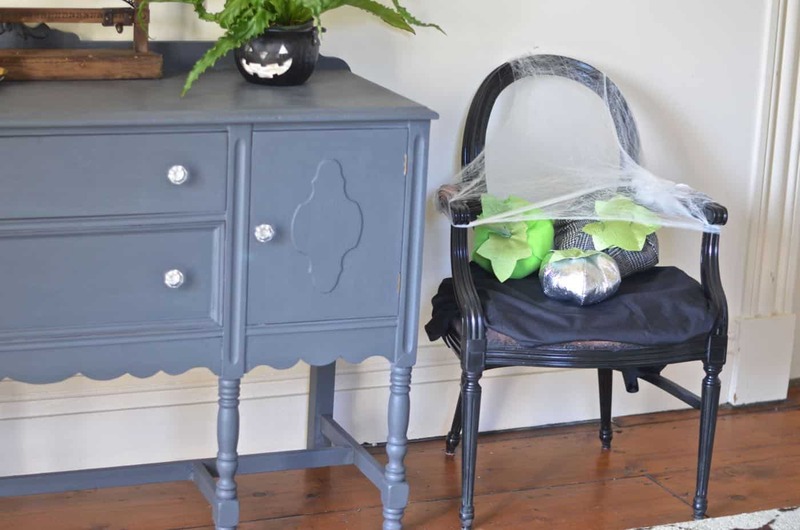 And I think you’re starting a new trend with the “ghost chair.” Thanks for organizing this fun blog hop! The rhino was touch and go for a minute. #stress 😉 Brace yourself for the onslaught of the new and improved ghost chair! So excited to go read all the posts! Charlotte, you are so funny. Your home is gorgeous and that says I lot because I know that 5 small people live there. May you always keep it real with your fun personality and your great photo angles. Oh my word. 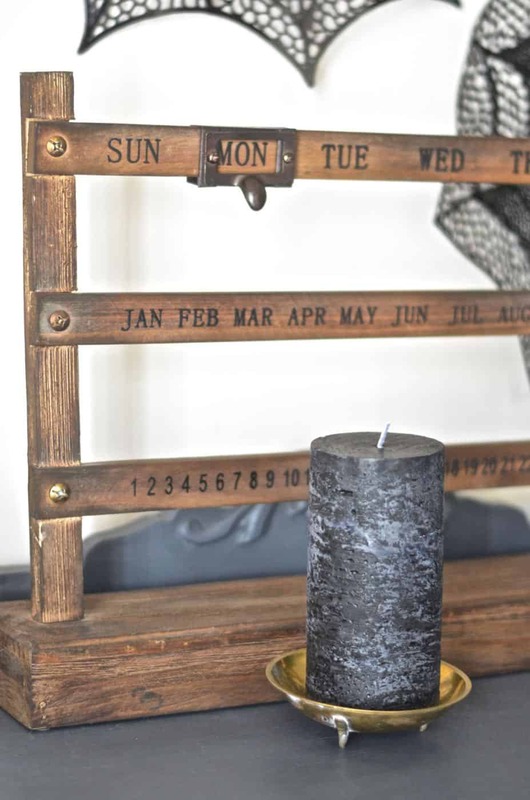 Finally getting around to reading this post because, you know…lazy. And I gotta say, you definitely are the winner here between the two of us. That skull…masterful. 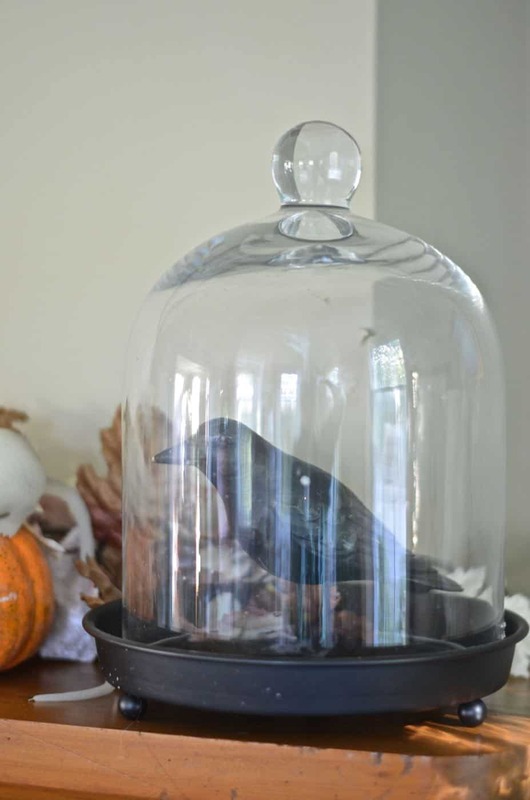 Raven? Completely brilliant. Rotting pumpkins? Just adds to the spooky Halloween ambiance…look at you go-getter?! Amazing. I am beyond inspired. Thanks for the real world check in! I love looking at pretty things, and get down when my own house isn’t picture perfect. Women put so much stress on themselves-we have to embrace where we are at this moment in time! You have a house full of little ones, I have 3-22, 16, 14 and teach Kdg. full time. Between the running around and work, I can’t have perfection at home. This post makes me feel so much better about that! Thank you so much for that! Happy Halloween!!! I love that ghost chair! such a fun idea! HA! Just you wait… I have some soon to be dead arborvitae for the Christmas holidays coming soon. 😉 So happy to have you on board! !